Hunter House, Newport, Rhode Island. Last week I was in Newport, Rhode Island (no, I wasn’t traveling with the President; I was conducting a marketing assessment for an historic site) and visited Hunter House, the historic house that prompted the formation of the Preservation Society of Newport County. Today the Society is best known for its Gilded Age Mansions (or Cottages depending on your point of view). 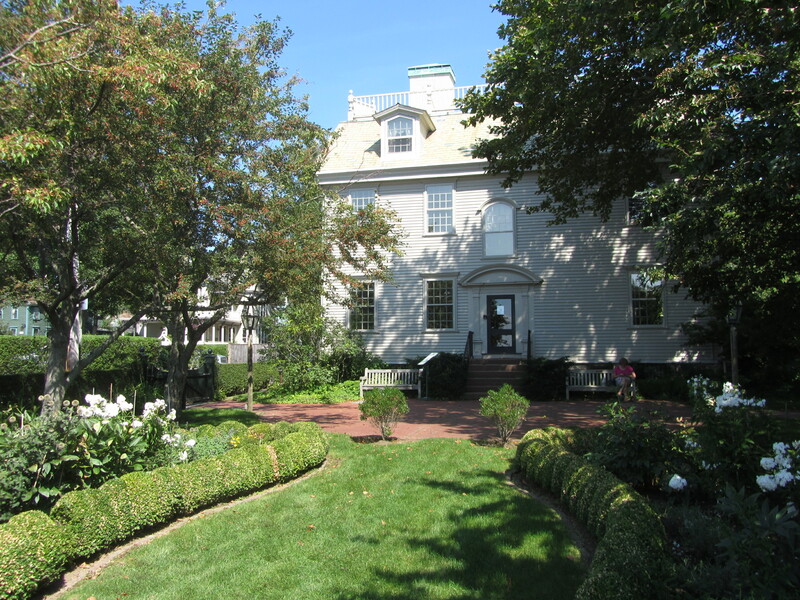 Hunter House has a beautiful view of the harbor but it’s off the beaten path and focused on colonial history, which doesn’t attract the crowds who make the pilgrimage to The Breakers and other grand estates along Bellevue Avenue. The lower profile gives Hunter House the opportunity to try a different approach to period rooms, one that I find much more successful from an interpretive perspective. Although visitors often believe that period rooms show how people actually lived, curators know they are exhibits created to evoke an era. While they may contain authentic furnishings, they are often displayed or arranged in inauthentic ways for aesthetics, safety, security, or lack of sufficient knowledge. Period rooms are also victims of tradition and nostalgia–how many times have you seen the parlor set for tea or a toy-filled playroom in a house without any children? Hunter House was able to overcome many of these weaknesses by carefully selecting furnishings to convey particular ideas about decorative arts. At first glance, they appear as traditional period rooms but a second look shows that something is “wrong”–there are two tea sets in a room, an armchair has no upholstery, or a suite of chairs is actually a progression of styles. Coupled with a skilled guide, it’s perhaps one of the best presentations of period rooms at an historic site that I’ve seen in a long time. Each room intentionally conveys one major idea supported by the furnishings and their arrangements, and the rooms work together as a whole to focus on the meaning of decorative arts in Newport in the colonial period (chairs aren’t just for sitting). If you are interested in learning more about the history and methodology of period rooms, see “Period Rooms and the American Art Museum” by Neil Harris in Winterthur Portfolio 46, no. 2/3 (Summer/Autumn 2012), 117-138 or “‘I Wish You Could Take a Peek at Us at the Present Moment”: Infusing the Historic House with Characters and Activity” by Nancy Villa Bryk in Interpreting Historic House Museums edited by Jessica Foy Donnelly (AltaMira Press, 2002). This entry was posted in Collections, Historical interpretation, Objects on September 2, 2014 by Max van Balgooy.